The high amount of building waste material requires innovative strategies for high-order re-use of the material. With Laser Induced Breakdown Spectroscopy (LIBS) both the elemental composition of building materials and trace elements can be determined with a real-time measurement, even on-site and in a harsh industrial environment. We present the experimental data on heavy metal detection in the ppm concentration range, as well as calibration curves. Further on we demonstrate the characterization of cement and concrete concerning the main components by means of Rankin diagrams. We suggest an implementation of LIBS in the processing of building waste materials to allow a high-order re-use. High-order recycling of waste material plays an important role for a sustainable use of resources. In the field of construction waste recycling up to now the material is used for low-value recycling (downcycling), e.g. street fillers, covers for landfill sites. An example for high-order recycling is the use of concrete-broken-sand as additive for new concrete. In 1998 the amount of construction waste was 77.1 Million tons in Germany only, and the fraction of recycled material has been more than 70%, mainly for road constructions. The high amount of building waste material requires innovative strategies for high-order re-use of the material. As building waste is a mixture of different materials, which might as well be contaminated, it is a precondition to characterize and to sort the material due to criteria depending on the further use. Recycled material must not endanger people or environment, therefore contamination with organic or inorganic matter has to be identified and harmful material has to be separated in advance. Concrete is an inhomogeneous material and recycling material is even more inhomogeneous. Nevertheless it is important to know the elemental composition, especially the ratio of Si, Ca, Al, Mg and Fe as the main components, to guarantee the quality of products and to minimize energy use for their production. With Laser Induced Breakdown Spectroscopy (LIBS) both the elemental composition of building materials and contaminating trace elements can be determined with a real-time measurement, even on-site and in a harsh industrial environment. In the field of recycling applications of LIBS have been reported for the sorting of scrap metal, the identification of plastic waste and the monitoring of emissions,. Inorganic additives in recycled thermoplasts could be identified. Inorganic wood preservers can be detected and a system suitable for industrial use in sorting plants has been developed. In the division IV.4 "Non-Destructive Damage Assessment and Environmental Measurement Methods" the method is used for the characterization of building materials,. With an Echelle spectrometer the spectral lines of main and trace elements can be measured at the same time. The main challenge is calibration for quantitative measurements, as the matrix, in this case the highly inhomogeneous concrete, affects the intensity of the spectral lines in a non-linear and unpredictable way. We present the experimental data on heavy metal detection in the ppm concentration range, as well as calibration curves. Another important contaminant is Chloride. Further more we demonstrate the characterization of cement and concrete concerning the main components by means of Rankin diagrams. We suggest an implementation of LIBS in the processing of building waste materials to allow a high-order re-use. The LIBS set-up (figure 1) consists of a Laser (Nd-YAG Laser, pulse duration 10 ns, maximal pulse energy 300 mJ, frequency 20 Hz), which is focused on the surface of the samples. The energy of the laser pulses is chosen, so that a plasma is induced and a small amount of material is evaporated. During the relaxation process atomic emission occurs and the element specific spectral features can be observed. The emitted fluorescence light is directed to the detection unit by an optical fiber. For multi-element analysis we use an Echelle spectrometer (LLA, ESA 3000, Spectral range 200nm - 780nm, l/Dl=40000, 10 pm resolution),, in combination with an UV intensified CCD detector (1024*1024 Pixel, 16 bit resolution). Time resolved measurements can be accomplished in the range of 100ns to some ms. This parameter can be optimized to an increased sensitivity for elements of interest. The measured data are saved in a detector specific binary format. Further interpretation is accomplished by software developed at BAM. In figure 2 a typical spectrum of concrete is shown in the wavelength range from 200nm to 780nm. The intense spectral lines of Calcium, e.g. at 393nm and 396nm, dominate the spectrum. The spectral lines are partially overlapping. The maximum spectral resolution is 10pm. This is shown for the wavelength region around the Carbon spectral line at 247 nm (inlay in figure 2), where the spectral lines of Silicon, Iron and Carbon are marked. Fig 2: Spectrum of concrete in the wavelength range from 200 nm to 780 nm. Inlay: zoom of the spectral region close to the carbon line, with marked carbon, iron and silicon spectral lines. Spectral lines with a medium spectral intensity are most suitable for further analysis, because a nearly linear dependency between elemental content and intensity can be expected. Very intense spectral lines might have their maximum out of the dynamic range of the detector. Spectral lines with low intensity lead to larger error bars. Evaluation is accomplished by gaussian fit of the spectral lines. The integral values are then normalized in respect of an internal standard to allow comparison between different measurements. In figure 3 LIBS spectra of mortar samples with different Lead content are shown. Lead has a spectral line at 405.8nm. Additionally spectral lines of the main components Si, Ca and Al can be identified in the displayed wavelength range. In figure 4 the values for the relative amount of Pb in mortar determined from the LIBS measurements are compared with values determined with a standard analytical method (AAS). The four series correspond to mortar samples with different contents of zeolites. The dependency shown in figure 4 is nearly linear. Fig 3: LIBS spectra of mortar specimens with different Pb content. Fig 4: Comparison between LIBS measurements of the relative amount of Pb in mortar and a standard chemical method (AAS). The four series correspond to mortar samples with different contents of zeolites. For quantitative measurements it is always necessary to determine a calibration curve for a reference material with a composition, which resembles the samples at the best possible rate. In figure 5 the variations in the elemental composition of some common cement types are presented by means of a Rankin diagram (ternary diagram). We produced specimens from cement only, without aggregates or added sand. The cements used are portland cement (PC), blast-furnace cement (BFC) and blast-furnace cement with added fly ash (BFC+FA). The typical composition of these cements is given in table 1. The results of the quantitative analysis, using a BFC-specimen as reference, are visualised in figure 6. Each single measurement is analysed, the oxide content is stoichiometric calculated by and the corresponding points are plotted in the Rankin diagram. The results for each cement type cover only a small area in the ternary diagram and show, that different cement types can be distinguished using this analysis. The positions agree with the theoretical values given in table 1 and in figure 5. Fig 5: Rankin diagram with cement types. Fig 6: Rankin diagram with results from cement paste material made of Portland cement (PC), blast-furnace slag cement (BFC) and blast-furnace slag cement with 30% fly ash (BFC+FA). Table 1: Typical composition of the used cements. Concrete specimens made with the same cement mentioned above have been investigated in the same manner. Figure 7 shows a photograph of a concrete surface with aggregates. On the left side spectra are shown, which have been measured at three different points along a line scan. Each line scan consists of 127 single spectra, which have been evaluated for the Si, Ca and Al content. The spectra demonstrate the change in line intensities for the elements due to the matrix inhomogeneities. 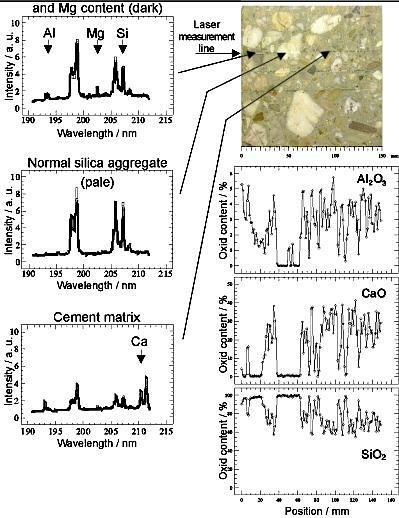 The spectra differ not only if the laser hits aggregate or cement, but also the aggregates have different elemental compositions. In this case the "dark" aggregates have a higher content of Al than the other aggregates. Below the photograph the spatially resolved oxide content for three main concrete components is shown, representing the natural inhomogeneity of concrete. In particular the inverse relation between the Calcium and the Silicon content can be seen at the position of a white aggregate. Fig 7: Photograph of the cut surface of a specimen showing traces of three measured lines. Left: typical spectra at three different points (top: dark aggregate, middle: bright aggregate, bottom: cement matrix). Below the photograph the spatially resolved oxide content along a measured line is shown. The results from these measurements on concrete specimens can as well be represented in Rankin diagrams, where the points are plotted according to the determined contents for Si, Ca, Mg, Al and Fe evaluated for each single spectrum. 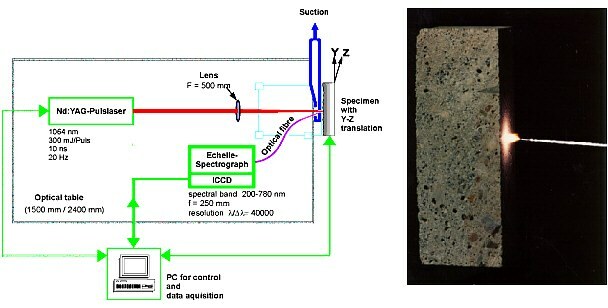 In figure 8 the results are shown for a measurement on a concrete test specimen made with Portland cement. Along the axis of the triangle, the histogram distribution is plotted as an additional characterisation of the specimen. Due to the aggregates in the concrete, the relative amount of silicon oxide varies broadly between 100%, i.e. pure aggregate, and minimum values corresponding to pure cement spectra. In figure 9 and 10 measurements are shown for unknown concrete samples. The specimen have either been cut or casted. The influence of sample preparation results from the covering element paste on the casted surface, which prevents the aggregates to be directly hit by the laser light. This results in a shift of the measured values towards the position of the pure cement material. The data measured on a cut surface are distributed in a triangle whose corners are given by the value for the pure SiO2, the value for the measurement with maximum Aluminium content and the value for cement paste. 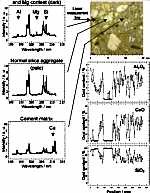 Additionally not only pure SiO2 aggregates can be present, but the influence of aggregates with Aluminium content is apparent. Rankin diagram with results from concrete specimen made of blast-furnace cement. Measurements were taken on a cut surface (red hashes) and a casted surface (blue triangles). The used cement type can be identified by the position of the values for cement in the Rankin diagram, which agree with the positions shown in figure 6. Also, the straight line along which the values are grouped, show a difference in slope as indicated at the bottom of the triangle by the CaO/Al2O3 ratio. Therefore the classification was made, that the results in figure 9 can be attributed to concrete made with Portland cement and the results in figure 10 can be attributed to concrete made with blast furnace cement. In figure 9 and 10 measurements are shown for unknown concrete samples provided by a construction company. The measurements were accomplished either on a cut or casted surface of the specimen. The influence of the surface results from the covering element paste on the casted surface, which prevents the aggregates to be directly hit by the laser light. This results in a shift of the measured values towards the position of the pure cement material. The data measured on a cut surface are distributed in a triangle whose corners are given by the value for the pure SiO2, the value for the measurement with maximum Aluminium content and the value for cement paste. The used cement type can be identified by the position of the values for cement in the Rankin diagram, which agree with the positions shown in figure 6. Also, the straight line along which the values are grouped, show a difference in slope as indicated at the bottom of the triangle by the CaO/Al2O3 ratio. Therefore the classification was made, that the results in figure 9 can be attributed to concrete made with Portland cement and the results in figure 10 can be attributed to concrete made with blastfurnace cement. This was confirmed by the contractor. The experiments and the results show the successful application of LIBS for concrete analysis. Trace elements and main components can be measured simultaneously with an Echelle spectrometer. Due to the natural inhomogeneity of building materials statistical measurements are necessary. A database containing calibration measurements on reference materials with well-defined composition is necessary for quantitative determination of element contents. For further interpretations advanced software is needed, which is optimised for the actual problem. In the recycling process of building material LIBS can be applied in a first step to ensure that no harmful contamination with trace elements (e.g. heavy metals, chloride) is present. Depending on the further use the material can be characterized in a second step due to its main components. Therefore LIBS can act as quality assurance and allows the specific addition from other material necessary for a high order re-use.